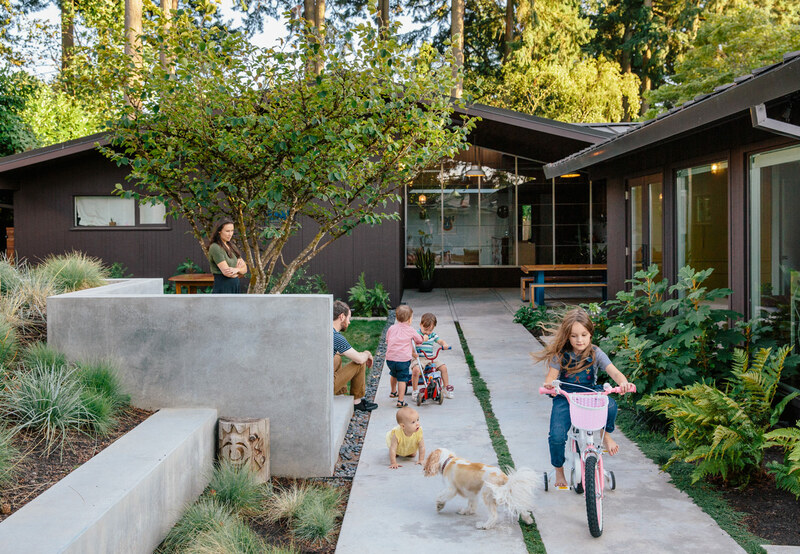 Aaron and Yuka Ruell transformed a Portland ranch house into a retro-inspired family home with plenty of spaces—like the trellised porch—for their four children to roam. In the kitchen, interior designer Emily Knudsen Leland replaced purple laminate cabinets with flat-sawn eastern walnut, and added PentalQuartz countertops in polished Super White for contrast. The cooktop and oven are from Miele. In the office, existing track lighting illuminates cabinetry covered in Lemon Bar by Miller Paint. The room also features built-in bookcases fabricated by Earthbound Industries and a vintage Sesann sofa by Gianfranco Frattini for Cassina. 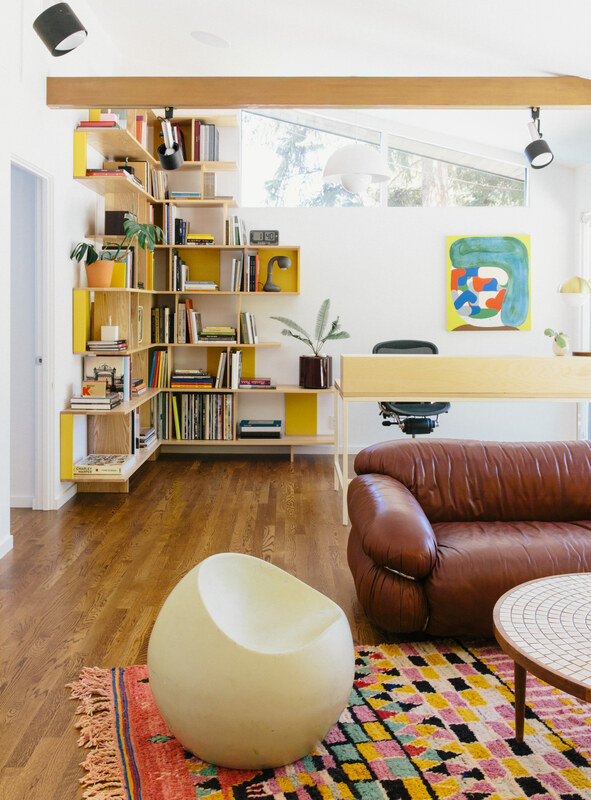 In the living room, the painting is by Geoff McFetridge and the wood paneling is original to the house. “Jewel-y color and simple shapes—they feel right in this house,” says interior designer Jessica Helgerson. The couple designed the master bedroom, choosing a new red carpet inspired by the original and a Half Moon pendant by Allied Maker. With four children under the age of six, the Ruells have learned not to be overprotective of their collection of contemporary and vintage furniture. In the living room, an Eames lounge chair and ottoman sit on a Moroccan rug from M.Montague, while the family’s eldest child, Mirene, surveys the indoor/outdoor view. Throughout the house, Kolbe windows and fixed glass (in existing jambs) were added to increase energy efficiency. The master bath is a bright sanctuary with a freestanding tub by Victoria + Albert and Ecostat shower fixtures by Hansgrohe. In the kitchen, Yuka makes baby Maude a snack at an island with original red tiles. Hanging cabinets were removed to maximize light and family-room views. an environment where midcentury tables sit beside contemporary sofas, and it’s all punctuated with textured fabrics, vibrant colors, and vivid artwork. Los Angeles, however, proved less of a match. Professionally, the city made sense: Yuka was a film editor, before leaving to raise their kids, and Aaron is a director and photographer, with an acting credit as Kip in the movie Napoleon Dynamite. But, on a personal level, despite their 10 years there, the couple was “never really on the same page as L.A.,” Yuka says. On a whim, they went away for a weekend trip to Portland, where they met a Realtor and fell in love with a house with midcentury details and a family-friendly layout. Though Yuka was pregnant with twins, and the couple had a young daughter at home, they immediately made an offer to the original owner, a woman in her 80s. “The timing was crazy, but we were like, ‘This is the place,’” Yuka remembers. The 4,300-square-foot house was designed by local architect William Fletcher in 1959. Cedar-paneled walls and a logical, linear layout show the architect’s style. 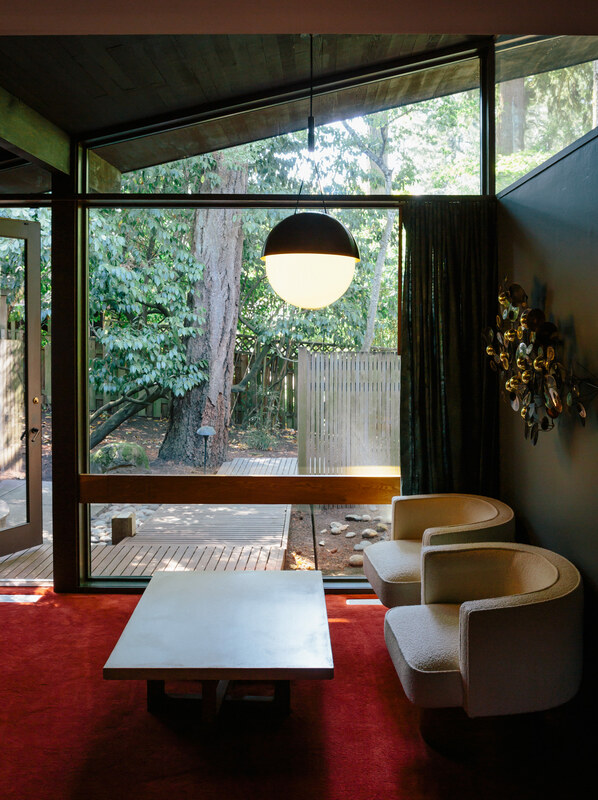 Touches like a children’s wing, replete with bunk beds and a reading nook; an art studio; and sculptures integrated into the home reflected the original homeowners’ preferences. Wanting to stay as close as possible to the original design, Aaron tracked down Dale Farr, who was a partner in Fletcher’s architecture firm (Fletcher has since passed away). Farr was tasked with making structural updates for a modern family, like extending the garage four feet to fit an SUV, and adding a media room off the front entrance to create a place for a 50-inch TV. The rotting roof shingles were replaced with dark metal standing-seam panels, which, Farr notes, “still look appropriate for the time.” And nearly all of the many single-paned windows were custom-fitted with double-paned glass—so they look the same but are now more energy efficient. After about 350 square feet were added to the home, Jessica Helgerson Interior Design collaborated with the Ruells on the interior. In the living room, a custom sofa in nubby wool nudges orange Ari lounge chairs by Norell, and sleek high chairs and Eames side chairs surround a Tulip dining table by Eero Saarinen. Pops of yellow and orange proliferate, in art and furnishings as well as swashes of paint—in large part driven by Aaron’s own visual acumen. Flashes of the original finishes remain: Sculptures by Portland artists Lee Kelly and Bonnie Bronson still stand outside and decorate the kitchen fireplace and island. And a profusion of vivid orange-and-yellow linoleum daisies still enliven the guest bath, as do a green tub and cheery red tile in the kids’ bathroom. Wood paneling was left intact throughout. 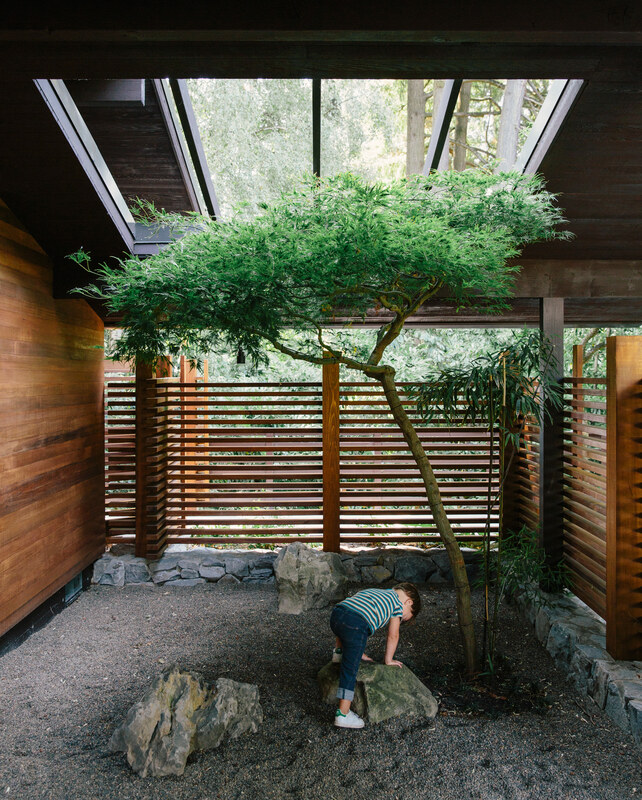 Despite Aaron having a feature film in the works and an intense travel schedule, the Ruells are charmed by Portland’s strong sense of community and verdant landscape. And like their new hometown, their remodeled home fits them exactly as they had hoped.